Kevin Rose has replaced Jay Adelson as CEO of popular aggregator site Digg, and one of his first moves will be to kill the controversial Diggbar. Adelson stepped aside to "incubate some new business ideas over the next twelve months." "As the economy exits a very deep recession, I believe that it is an excellent time for new companies to develop," he said. That brings founder Rose to the fore – and his appointment is likely to prove popular with Digg's vociferous fanbase. 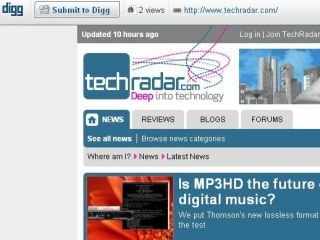 Rose will now oversee a critical period for the site as it evolves, and has already made it clear that the controversial Digg bar will be for the chop. "Framing content with an iFrame is bad for the Internet," said Rose in a blog post. "It causes confusion when bookmarking, breaks w/iFrame busters, and has no ability to communicate with the lower frame (if you browse away from a story, the old digg count still persists). "It's an inconsistent/wonky user experience, and I'm happy to say we are killing it when we launch the new Digg."